In 1940 the Martha's Vineyard Hebrew was born and incorporated by some fifty people; there were only ten last names among the fifty.. The Lithuanian town from which Samuel Cronig departed may have been cluttered but New York was a teeming jungle; it was not for him. So, two years after arriving in America, he left for New Bedford. He had heard that in this relatively small town life was, if not easier, at least far less harried. And there were some Jews in New Bedford to whom Samuel could - might claim kinship. 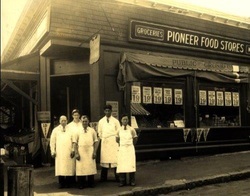 Times were hard and work was scarce in the years following the Panic of 1907, in New Bedford as in the rest of America.. Samuel needed a more secure job than was available in New Bedford. He laboriously checked the classifieds in the New Bedford Standard and saw an ad offering work on the Daggett Farm on Martha's Vineyard. He rushed over. He had never done farm work but what had that to do with a strong, young man - late of a Lithuanian yeshivah? He worked hard and spent little. Carefully, he put aside the bulk of his money. Like almost every new Jewish immigrant to America, Samuel's responsibility was to those he left in the old country. His first savings were not to better himself, not to go into business, but to bring family out of Russia and to America. Within five years of his arrival he was joined by four siblings. We record Samuel Cronig's history, not because his story is unique, nor because he was the first Jew to arrive on Martha's Vineyard, but because his story is the story of so many of our parents and grandparents. It parallels the history of other early Jewish settlers on Martha's Vineyard and of generations of off-Island Jews. Samuel Cronig arrived on the Island in 1911. ​of the American Jewish Faith"
Two years later the Judel Brickman family - soon enlarged by four children arrived from Sweden, a way-stop on their journey westward. The first incorporators of the Hebrew Center carry the names of the families that came here in the first two decades: In addition to Cronig and Brickman, they were: Butler, Hall, Issokson, Kligler, Levinson, Miller, Osman, Pearlstein. That so many of these names still grace the membership rolls of the Center, and are familiar to all Islanders, is a tribute to the dedication and tenacity of the Vineyard's Jewish community. Most of the early Jewish residents of the Island carried on the Jewish observances they had been taught as children. Kosher meat was imported from New Bedford. Holidays were celebrated, either on the Island or with relatives on the mainland. But they were soon too numerous for such haphazard arrangements. Not everyone could have a family celebration, not everyone could leave the Island to celebrate with relatives. So they met regularly in each others homes for religious observances and the attendant social functions. But even on the Vineyard, where large home gatherings were the rule, there were no (Jewish) homes large enough to contain the growing Jewish population. Maybe for Rosh Hashanah, but Yom Kippur? And Pesach was another problem. New Bedford for weekly instruction of the children in the tradition. Still the community kept growing; too large for the informal arrangements that (almost) met the needs of the smaller community. That was one stimulus to the organization of this Center. There was another, more subtle but equally pressing. In spite of the growing acceptance - sometimes strong friendships - between individual Jewish and Christian Islanders, the Jews as a faith community, as a people and a religion, were not accepted - certainly not as social equals. Members of the Center still on our rolls, who were school children then, remember the social ostracism, the name-calling, the catcalls, they endured because they were Jewish. Thus Vineyard Jews of that period lived a sometimes lonely existence. It was complicated by the isolation inherent in island life. They couldn't easily drive to larger towns with larger Jewish populations. The Island Jews had to depend on their own resources. There was great need for a formal gathering center. There was continuing (some say constant) talk, planning, drive, to form a center that would truly fill community's needs. It began in 1937 with, naturally, a drive to raise funds for the planned center. The community was willing, the community was small and the members had a Jewish pride (not unlike their non-Jewish Island neighbors) that said, we will not ask help from off-Island; we will do it ourselves. It was going to be a long haul. In 1939, Henry Cronig found a solution. He knew of a large colonial home that was for sale - if the buyer would move it quickly. Henry bought it immediately, and turned it over to the Jewish community at cost. Since a building could not be owned by something as amorphous as a "community", some formal entity was needed. 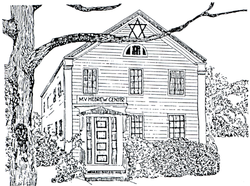 So the Martha's Vineyard Hebrew Center, Inc., three years in gestation, was born and incorporated by some fifty people; there were only ten last names among the fifty..
A lot was quickly found on Centre Street (most appropriately named) and the house was moved to it. 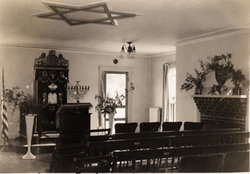 It was remodeled into sanctuary, meeting hall and school room. It was completed and dedicated on July 28, 1940. That historic building was moved to an adjoining site in 1995 (and is now a home for a Center family). In its place we built a new congregational home suitable for our future. Truly, then and now, it fulfills the ancient requirements of the synagogue; it is Beth ha Midrash, a house of instruction; Beth ha Tfillah, a house of prayer; Beth ha Knesset, a house of assembly. This, then, is our heritage. The ten families listed as signatories on the incorporation papers have grown to approximately 350. Whether our names are among those listed as members in 1940, or barely dry on today's membership list, all that went before is part of our heritage. We are part of all the struggles and the joys that went into building this place. We share in its past and ours is the vision of its future.